I thoroughly enjoy following your doings, and even included your exhibition in the upcoming “should go see” section of (local publication). My silly point is to ask about requirements of membership. I have many watercolors and am as terrible at using them as 20 years’ of experiments can show. However, I would be happy, I think, to come out with you all (because working alone is no fun) and painting. You look to be having great fun. Your captions speak volumes. I don’t need/want to be official and photographed, b/c it would undermine your credibility, I am SURE! However, I’d like to be an adjunct, if there is a role for that. Greetings and salutations from all of us at KC PAC. You’ll have to forgive us for the delay in this communiqué. Our Monday Morning Meeting went well into the night last night, and that is why we’re only able to respond to your message today. What goes on in our Monday Morning Meetings, you ask? Well, every Monday, we meet to discuss any messages the Group has received in the six days prior, and which (if any) of those messages warrant a response. Because we are in fact a Group of like (if not wholly equal) members, it is important that we draft responses that incorporate and placate the concerns of all Group members. At last, once a Final Draft of the Facebook Message Reply is approved by the “Authoring Members,” a quorum must be present in order to pass a final vote: Send or Save as Draft. As you can probably imagine, this careful work takes time. There are many messages that never get sent. The gavel usually strikes during one of the earlier hours of Tuesday morning. 1. You must be willing to become a member of KC PAC*. 2. You must be able to become a member of KC PAC**. 3. You must be a mammal***. 4. You must commit a breaking of bread with other members****. 5. You must make marks, of some kind, during our session*****. * Willingness is demonstrated by following through. You must actually show up. ** Ability is a matter of proximity and access. You must live in the Greater Kansas City Region (draw a triangle from Wichita, Kansas to South Bend, Indiana to Minneapolis, Minnesota—this is the region in question, though we have re-districted twice already). *** This antiquated rule probably won’t survive the next legislative session. It is not enforced. But for now, it’s the law. **** There are only two KC PAC seasons, as we are committed to making outdoor marks via observation at all times of the year, every week, life permitting. Those two seasons are Winter and Summer, and they cover every week on the calendar. That’s right, every single week. Even if we are not able to be with the central group, we form one-person satellite sessions at our locale, and we upload our entries via Facebook, all the same. Anyway, we’re getting ahead of ourselves. The point is that there are two seasons, and that determines whether the required meal is before or after KC PAC’s actual session. In the winter, we eat breakfast before we make marks, so that nature may quietly bake what little warmth it has to offer in to the air that we will breathe and observe through. In the summer (starting next session!) we make marks first, and then cool off with a brunch or lunch, depending upon how intense the session was. We know what you’re wondering: “OK, so I have to break bread to be a member, but when can I drink with the KC PAC’ers?” Great question. Drinking is permitted and encouraged at breakfast and lunch. Especially breakfast. It is important to be warmed from within. ***** As KC PAC Co-Founder Robert Josiah Bingaman once said to KC PAC Co-Founder Leeland Piechoski, “There is one rule in KC PAC — you have to make marks of some kind. And you have to follow the other four rules. That’s it. That’s the rule. It’s that simple.” This one really should not require more explanation. We see it as a way of reigning in would be ragamuffins and their video-performance drug-addled whodunit art. And also as a way of elevating the confidence (and lowering the intimidation factor) for our potential members who are wondering about their facility and ability. One needn’t ever worry about such things. If your work really is ‘bad,’ we’ll just hold an emergency legislative session after which you’ll likely be asked to leave the club. NBD. This has never happened, however, and some of KC PAC’s most wise and longstanding members have offered their doubts that it ever will. So, with all of those items for you to consider. We’d like to offer you an invitation to our next session. The process by which you are initiated and establishment as a Member is actually implemented and finalized by you alone. Should you choose to join us, Sunday, 9:00 AM at a location that will be disclosed later in the week, and should you choose to stay to make marks and eat breakfast, you will officially be a Junior Member of KC PAC, no fees due*, **, ***. * Fees are often discussed however. If, in one of the many legislative sessions before Sunday, fees are brought before the quorum, they may in fact be passed as a regulation, in which case you’ll likely need to bring in excess of $300 cash to the meeting. ** If you should come a second week, your Junior Membership will end, and you will officially be a Member. Come three times? That’s right: Senior Member. The five levels of Membership, in ascending order of rank and seniority, are: Junior Member, Member, Senior Member, Founder, Father Niewald. *** We will need the email address you would like to have associated with your KC PAC Membership in order to invite you to our next session. This address will only be used for session communiqués and some spam. 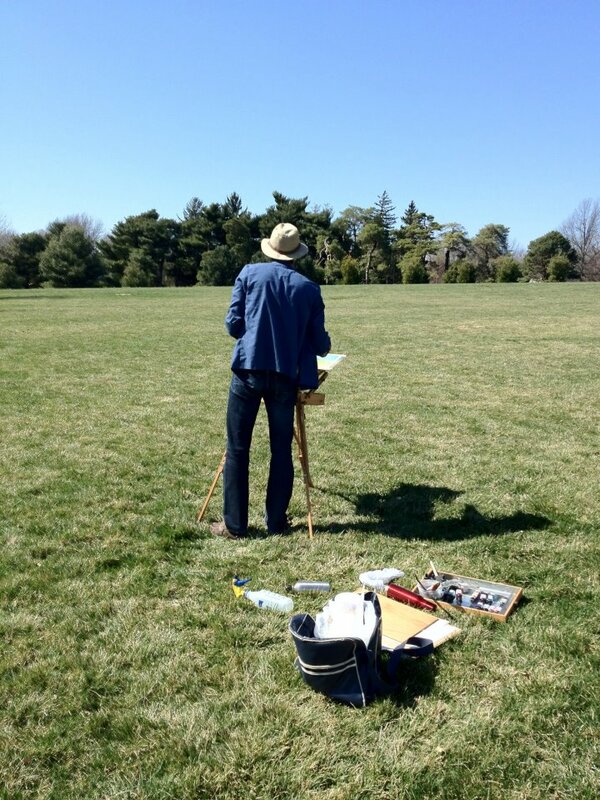 We hope we’ve been able to address your questions and concerns, and we would like to extend an official welcome from Kansas City’s premier Plein Air Coterie. We each hope to meet you and learn more about you at our upcoming debut exhibition, where you are sure to meet all of the movers and shakers in the Midwestern art scene — even those not associated with the Coterie!